At the start of something new, it is good to look back at where you came from. As far back as I can remember, working on creative projects was at the center of my universe. I entered art school to expand my techniques and learn how my artwork fit into the fine art academic discourse. 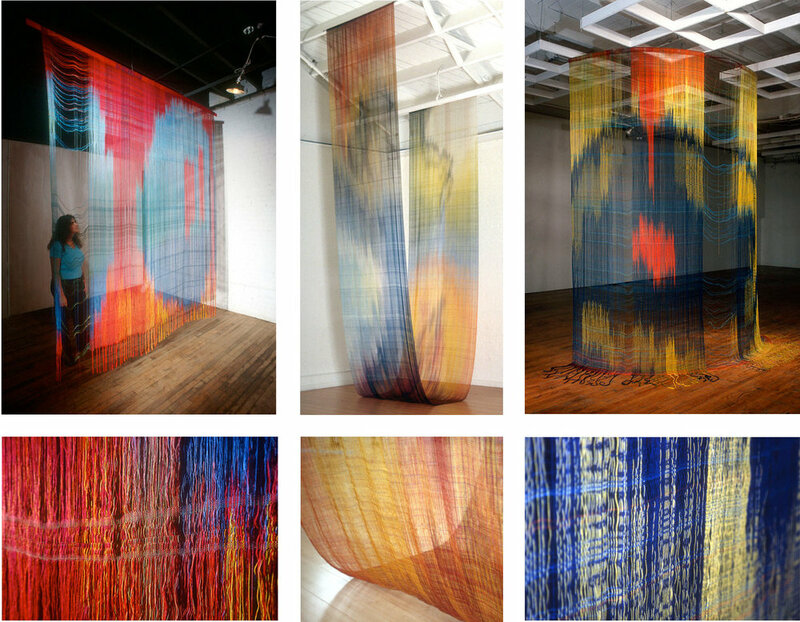 Seeing how the ancient processes of textiles were done with modern techniques inspired me to create large scale installations of fine fabric made of hand dyed and hand woven sewing thread. Vibrant colors in simple compositions create a hazy colored atmosphere that is surging with motion. The work is more of space than matter. Such translucent fabric arouses the illusion of it slowly emerging into being or dissolving away. Humans live somewhere in between the vastness of galaxies and the minute collisions of atomic particles. These pieces investigate the extremes of the macrocosm and microcosm through works of a grand scale achieved by the laborious process of hand weaving sewing thread. Standing many times the height of a person, each installation unites with the architecture around it. The hundreds of lines forming its structure create a momentum that rushes past the ends of the piece, visually cutting through the limitations of floor and ceiling. After finishing a 17-foot installation for the front entryway of Brandeis Hillel Day School in San Francisco (on the right), it was time for me to respond to a long pushed aside desire to learn more about science, beginning with the math needed to understand it. Enrolling in a local community college to retake College Algebra started me on a path of learning math and making math art. My studies continued with Trigonometry, Precalculus, and Calculus I, but I stopped taking classes because my art math projects and research had to take precedence. While taking those math classes, I began a series of experiments to make spherical forms with the triaxial weave structure pictured above. To understand different ways of making the forms, I began studying regular 3D forms called polyhedra ("poly" means "many and "hedra" is "faces"). The geometric connections between polyhedra are fascinating and as I increased my understanding of the shapes, I kept learning about more new concepts to explore. In the midst of this obsession, I was hired by the Exploratorium to be an Artist-in-Residence for their traveling Geometry Playground exhibit. All artists seek to capture excellent images of their work, but the metal polyhedra I made were so photogenic that what began as documentation turned into a 223 page book, “Polyhedra: Eye Candy to Feed the Mind.” I spent 4 years researching, writing, and making diagrams for the first chapter, Introduction to Polyhedra, that uses an easy to read text to explain the geometric connections between shapes. The book is now in print, thanks to a successful Kickstarter campaign and I have a small business of selling 3D coloring books from an idea that started as a Kickstarter reward. My set of Cubes and Things 3D Coloring Books lets adults and children color and construct their own polyhedra. I lead math art workshops, called Polyhedra Parties, using pages from my coloring books in schools, museums, Maker Faires, and private parties. Do you want to work on a really big sphere? While working at my Polyhedra Party booth for the big Bay Area Maker Faire in San Mateo, a man named Gleeco stopped by and asked me that question, "Do you want to work on a really big sphere?" I quickly answered, "Yes!" He showed me his card for Planet, an Earth-imaging company, and told me about their Artist-in-Residence program. I was so excited about an aerospace company that saw the value of the arts, offered the chance to be around a bunch of engineers developing new technologies, and a welcoming space for artists to make art and learn. I went through their application process and I've been hired to be Planet's Artist-in-Residence from November 2017 through January 2018! Founded by three ex-NASA engineers, Planet currently has 140+ small imaging satellites, called Doves, that are now in orbit and taking photos of the whole earth everyday. They are a special company that takes pride in designing all their own software and building their own satellites. Planet does another remarkable thing to their satellites: Unique artwork by the in-house artist and community is laser etched onto every satellite’s side panels. Each satellite also has art silks-screened onto the bird like solar wings and other internal components. Yes, they have their own art gallery in orbit, with each piece traveling around the Earth every 90 minutes, 7 kilometers/second! The artwork on the Dove pictured above is by Forest Stearns, Planet's first Artist-in-Residence and founder of the program in 2013. Forest started with the fledgling aerospace company as the 25th employee and has expanded his position in the growing multinational firm of 500+. He leads many culture driving projects from murals to museum exhibits at the now established earth imagery centric company. As the Director of Planet's Artist-in-Residence program, Forest navigates the current AiR through the environment of this aerospace company. He continues to use his mural/graffiti/graphic design skills for a huge range of projects at Planet. One of my favorites is a painting he recently made to be put on the top of a rocket launched on October 31, 2017. This was Planet's first launch as a united family of both the medium resolution Dove satellites and high resolution SkySats, recently acquired from Google, and they celebrated it with artistic style! As their Artist-in-Residence, I am able to log in to Planet Explorer and visually roam all over our fascinating world for images that would look perfect around a polyhedron. Below is an image of El Centro, California, just north of the USA/Mexican border. I also like to use images from the Gallery page of Planet's website. There team has shared a bunch of stunning pictures that they put up under a Creative Commons license. The image below is from the northern Caucasus region of Stavrapol Krai, Russia. The green squares come from the farmland of El Centro, California, just north of the USA/Mexican border. I couldn't resist squaring the squares, while also enjoying areas where the symmetry has organic breaks. I used one of Planet's Gallery images for the lines in earth tones that zig-zag around the form. This agricultural region in the northern Caucasus is Stavrapol Krai, Russia where they are growing grapes and grain (according to caption Planet included with the photo). When I saw the perfect 90 degree bends in this picture, I knew I wanted to used it to show off the unexpected symmetrical twist of the small rhombicub-octahedron. For the picture below, also from Planet's Gallery, I wanted to use every part of it to go around a dodecahedron. 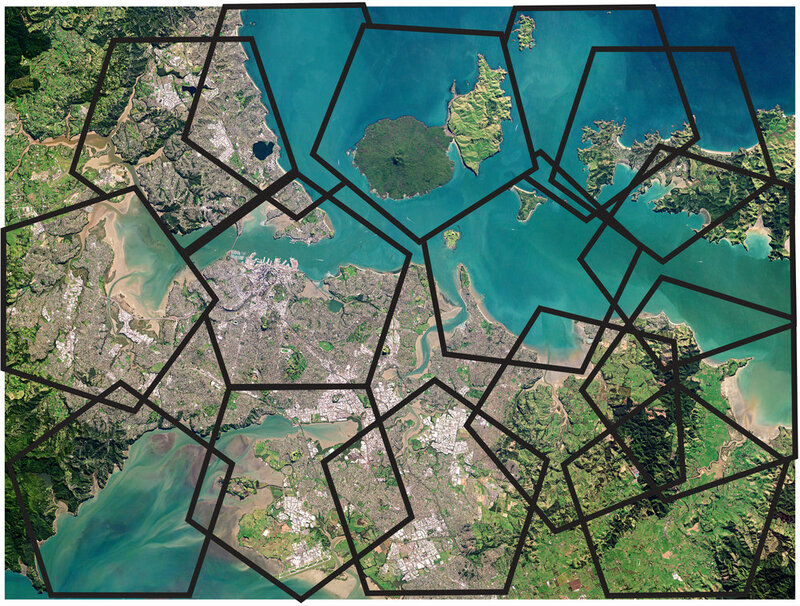 When I saw the Rangitoto (volcano) Island and Motutapu Island in the upper middle, I couldn't resist framing them with a pentagon. This image is from Auckland, New Zealand and, according to Wikipedia, the volcano has been inactive for over 500 years. You can see the 15 interesting pentagonal compositions I liked from this image. I choose 12 that worked together with just the right balance of land and sea, and placed them on the 12 faces of a dodecahedron. I have to share a very simple concept that keeps overwhelming my mind as I work with this kind of imagery: First, begin with a spectacular picture. Frame it with a polygon, so the focus zooms in on only the framed area, and you will find a new fantastic composition. It feels like magic to start with one lovely rectangle and get so many perfect polygons from it. My goal is to make at least 18 of these Polyhedra Planets: the 5 Platonic Solids + the 13 Archimedean Solids. Below is a picture of 3 more shapes. For those who want to see all around the shape, there are short stop motion videos with the descriptions below. On the left some might recognize a soccer ball, but it will impress mathematicians more if you call it a truncated icosahedron. The bold blue water of the Tylihul Estuary, Ukraine, (that I downloaded from Planet’s gallery) encircles this imaginary world defining two landmasses. My delight in the points and curves of this picture resulted in a longer video, as I took more photographic turns around the shape to examine how the moving composition feels when the water is vertical versus horizontal or when the visible area is dominated by the large land mass compared to the pointy shores of the smaller one. For the cub-octahedron (in the center above), the geometer in me could not resist how perfectly the 6 x 6 squares of farmland from El Centro, California, fit into the 6 big squares. All 8 triangles of the cub-octahedron show areas where the desert meets the cultivated land on the outskirts of town. Jacksonville, Florida, is the source of the amazingly symmetric highway interchange set into the octagons of the truncated cube on the right above. My first attempts to use the natural rich green of this area gave it an odd fake appearance, so I made it more unnatural looking by increasing the contrast and and making it a deep blue to set off the swirling lines of the highway. Come back for the next blog in this series, to see other new worlds I will create with Planet's imagery, watch them come to life in new stop motion shorts, and other geometric experiments combined with satellite images. Including a project with Forest using a net I made of Planet’s radomes. Our goal is to construct a pair of models with the paintings he did (from these radomes in New Zealand) on the outside and the dish on the inside. Cubes and Things: Color and Construct your own geometric shapes! The different patterns on each page of Cubes and Things welcome you into the wonderful world of a coloring book, but the good times get even better as you assemble your own geometric shapes! You will be fascinated watching the 2D design fold into a 3D form, and surprised at how easy they are to make. For years I've been addicted to making these many faceted geometrical forms called polyhedra. And now I have a way to share this delightful creative experience though my new collection of nets. The term 'nets' refers to the different 2D plans, groups of connected polygons (triangles, squares, pentagons, etc), which fold up to become snazzy 3D shapes. To construct your own polyhedron from a net: cut along the outer edges (keeping it all in one piece), then fold it along the inner edges, and tape it together. Once your form is completed, the next level of enjoyment begins as you contemplate the intriguing symmetries that the pattern creates around the form. In the center of the five images below is a diagram of an octahedron, which is made up of eight equilateral triangles. The other four pictures are of an octahedron with a pattern from Cubes and Things - Platonics Plus - Net Book #1. Each triangle has the same simple design, but as you rotate it you can see how it changes from different view points. The two pictures on the left show a four-fold symmetry and the two on the right are of a two-fold symmetry. Although I always support whimsical aesthetic additions, coloring these shapes is not only decorative. It emphasizes the different aspects of a shape and its pattern. Does seeing the same view with and without color, give you ideas of how you might color it differently? The result is a cool sculpture that looks great wherever you place it around your home, which also teaches you about the shape's geometry. The fun and easily accessible parts of mathematics come from observations into the nature and qualities of an object. There is no need to find time to study, when you learn something of the 2D pattern and 3D form while you were coloring and constructing it —and then even more from looking at or playing with the completed shape! Platonics Plus - Net Book #1 has 28 shapes on 19 pages. There are 10 different kinds of polyhedra. Some are smaller with several nets on 1 page, others fill a page, and a few cover 2 pages. Platonic & Archimedean - Net Book #2 has 32 shapes on 36 pages. It has the 10 polyhedra that are in Net Book #1, plus 8 more shapes. This net book has twice the pages because the additional shapes are bigger and more complicated. For those who want to make as many shapes as they can and are thinking of getting both net books, all the polyhedra/pattern combinations in the two net books are unique. Though there are no duplications of a certain pattern on that same polyhedron, some tile designs are seen on several forms. As in the examples above, I was so entranced at how one pattern changed depending on the number of faces meeting at the vertex (mathematicians prefer that term for the corner) of a polyhedron. ▪If possible, leave the last piece only connected on one side (m). Put tape on all its remaining sides (with tape on the outside (n) or on the inside (o)). After you carefully press the piece into place, you can no longer apply pressure from the inside. This is when you use the attached pin. Poke it through the vertex and under the edge you are taping (p). Now you can secure the last pieces of tape by pressing your finger down on the outside and, (with the pin) up from the inside. To start things off right, the first 200 net books will come with an attached pin! Now that the work of completing the net books is done, I want to share this special experience with as many people as I can. Joining in with those looking for new ways to inspire a joy for learning in STEM & STEAM programs, I want to work with schools, summer camps, and after school programs to have Polyhedra Parties! Polyhedra Parties are the perfect blend of focused play that gently moves towards learning math. The beauty of the shapes can make someone curious to learn a little bit about their geometry. This leads to the kind of thinking involved in understanding how to categorize these different shapes, which can open the door to the enquiring mind that is hungry to learn more. Also, the concepts of symmetry observable in polyhedra are a part of very high level and fascinating mathematical subjects. If you know of a group in need of a Polyhedra Party (for kids or adults, academically focused or not) and who would like me to lead their event, send me an e-mail at cubesandthings@gmail.com. I can come well supplied with a stack of nets, markers, crayons, scissors, and tape, as well as examples of my art which led to my passion for polyhedra. My years of experience teaching art and my enthusiasm for polyhedra make it an excellent experience. Polyhedra Parties are so much fun! Thank you for reading this and please let me know what you think of it! Polyhedra are super cool objects to make & study. - See Polyhedra book to get hooked! A confession: my woven pieces were 30 foot algebra problems. - See below. I like beauty in art & equations. - See in next post. Weaving transported me to a delightful place in a way nothing ever had in my life. I like all the different steps of weaving: planning out the project (more about this below), warping (measuring out the lengths of vertical threads), marking & dyeing my yarn (washing out isn't fun, but seeing the excess dye swirling around the sink is beautiful), I even enjoy threading the reed & heddles (setting the order & structure for the fabric), winding on (feeling & watching all the vibrant threads pass through my fingers), and, when I finally get to weave the weft threads in, watching the fabric grow is fantastic! Working out such math problems for art projects was a secret world of math that I couldn't share, even with my weaver friends. Most people weren't thinking about making projects in this way, but I spent many happy weeks working out all the details. The work existed both as a fun mathematical problem to solve and requiring artistic imagination to envision a huge installation of glowing colours that had a bold strength and a quiet delicacy. My pleasure in playing with numbers and in reading layman's science books led to me to re-take College Algebra, 5 years after getting my MFA. I enjoyed studying math, but it all didn't come easy to me. Though I had to work at it, I was used to hard work from my weaving projects. I went on to take Trigonometry, Pre-Calculus, and Calculus. -You know you can't leave an artist alone in a room with math for long before they start making geometric forms. The planning involved in working out geometric shapes fit right into my artistic process, but the creation of these forms was so fast & simple compared to my woven pieces. Every night a new funny little geometric shape was added to the round table in the living room. Their ever growing numbers were reminiscent of the Star Trek episode Trouble with Tribbles. Though most forms were spherical, each one had its own structural story that fascinated me. I had so much math to learn! Always searching for related topics, I studied whatever I could understand enough to read. George Hart's extensive website http://www.georgehart.com is where I really started to learn about this subject and Wikipedia taught me a bunch, too. I became a regular at the UC Berkeley Math Library; gleaning as much information as I could! The study of a simple 3D shape, like a polyhedron, is a tiny introductory part of higher math concepts that most math writers assume you can work out on your own. Some books I keep going back to: slowly learning enough to read deeper into the book, while with others I couldn't get past the introduction. I've been in a self-directed math class with no teacher and no real point, save curiosity. There was something so captivating about these abstract concepts. Books that would put many people to sleep were keeping me up at night because I just had to try to learn this next idea! So many new theories danced around my head in delightful way, similar to the early rough images of an art project. Studying math took the place of planning weavings. While you take time to digest that last bit, look below at a photograph my Dad took of my early woven reed experiments. If you want to see more, go to http://www.stacyspeyer.net , click on tangents and then geometric forms. In the next post, I'll see if I can explain how the math world's love of beauty matches my own creative inspiration. The book is finished! After about 4 years of researching, writing, and making diagrams, I got through the home stretch of the last 200 hours of re-doing the layout and editing. I am still so happy to have the first copy in my hands! As one of the rewards, I designed a collection of nets (the 2D patterns of polygons, which fold up into polyhedra) with patterns that reveal different symmetries of the shapes (see below). I'm developing these 'net books' into something I can sell. This has given me a bunch of ideas for other products. -For an artist who often spent a year or more on one project, the idea of making small items that many people can enjoy is a shocking new head space to be in! Inviting others to use my net designs turned into an experience I can share as a 'Polyhedra Party,' filmed in the Kickstarter video. For years I've been wanting to find a way to bring my playful version of math into the lives of children & adults. Along with my book, I can use the art of making to invite people to discover how fun math can be! I joined on-line communities where I connected with special friends and found places filled with cool information. I am so excited to continue traveling in this virtual world and to see where these connections can lead! I feel so changed by this whole experience, but it is just a beginning. I want to give the Kickstarter a try again in a year, when I've had more time to promote the book, find more people & places interested in it, make deeper connections, and look into grants for partial funding of the project, too. Thank you for reading my very first blog post and please let me know if you have any suggestions.